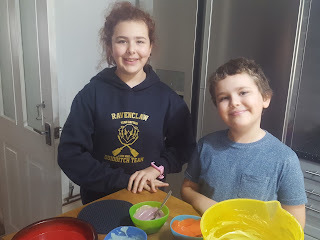 When we sent this picture to Flyfour to show him what we had got up to one day during the Half Term, he asked us where we had stolen the picture from. Apparently, he'd forgotten that we now have a nice new shiny Kitchen (an update post coming soon!) and didn't recognise it in the picture below. I would be insulted, but I guess that it means he was impressed with our efforts if he thought I'd stole the picture from somewhere! Today, I thought I'd share how to make the spooky cakes as they are nice and tasty, ridiculously easy to make but look spooky and like you spent hours working on them! I always use a standard mixture for my cakes and just increase the quantities as needed. To make the large cake and the 12 Cupcakes I doubled the quantities of ingredients below. For my recipe, you need to cream together the butter and sugar, before adding in the flour and eggs and giving a good mix. I've taken to not using my whisk of late when I'm baking cupcakes, hoping that the mixing will give my arms a good workout, I can't say it's working but it makes me feel better! We had selected some of our favourite Halloween colours from the pantry, Blue, Green, Orange/Yellow, Red and Purple. Top Ender, Dan Jon and I separated the mixture into a few bowls. We did it by eye more than by anything else, but you could always be exact and use scales! 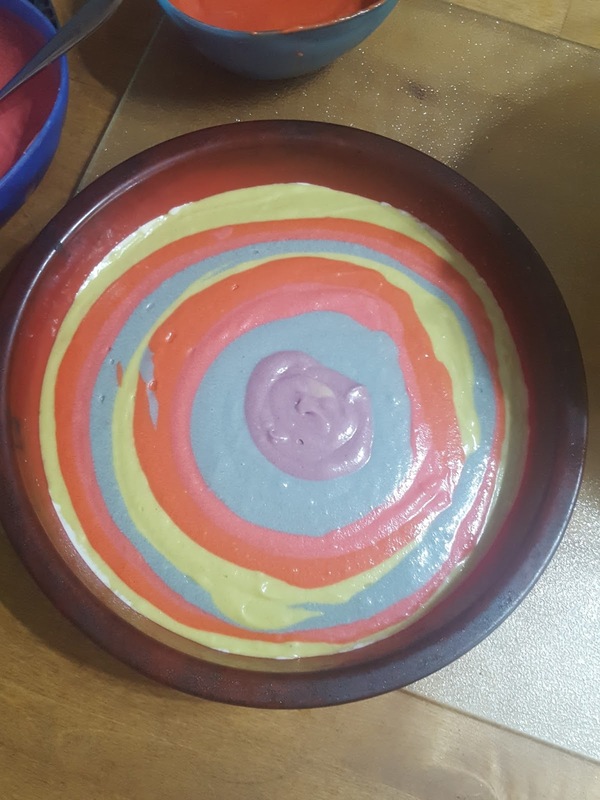 Once we had mixed up the colours, we filled our large Zebra cake as we thought that would take the most of all of our colours. 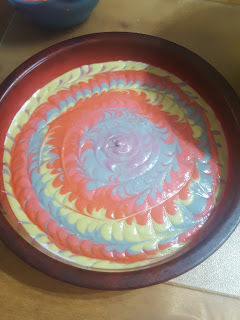 To make the Zebra Cake, you take a spoonful of each colour and "dollop" it into the middle of the cake pan. 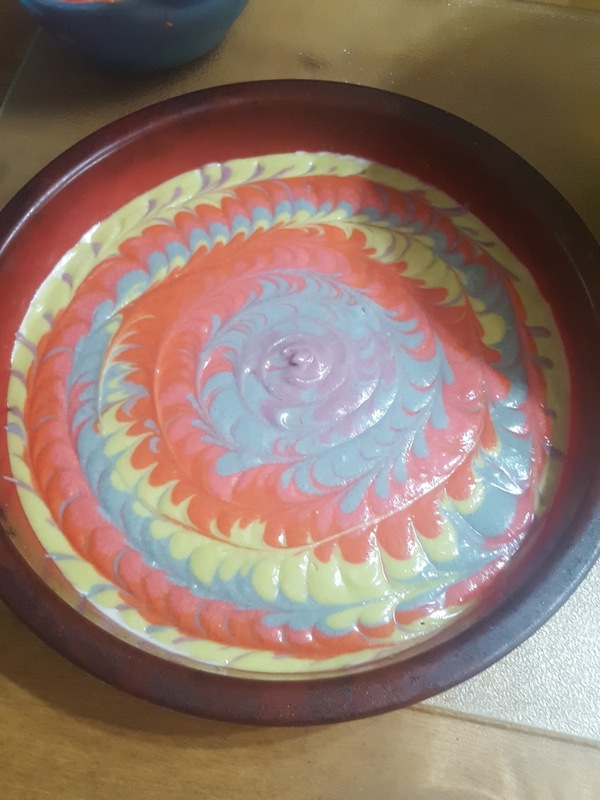 As each colour is placed in the middle, it pushes the previous colour out to the edge until eventually the cake pan is filled and it looks like some kind of tasty cake ripple. It was at this point that Top Ender thought our cake needed a bit more... pizazz! And so we ended up running a toothpick through the mixture to create some swirls. It started to look a bit Swinging Sixties, but we decided that we didn't care, we just hoped it would taste nice! 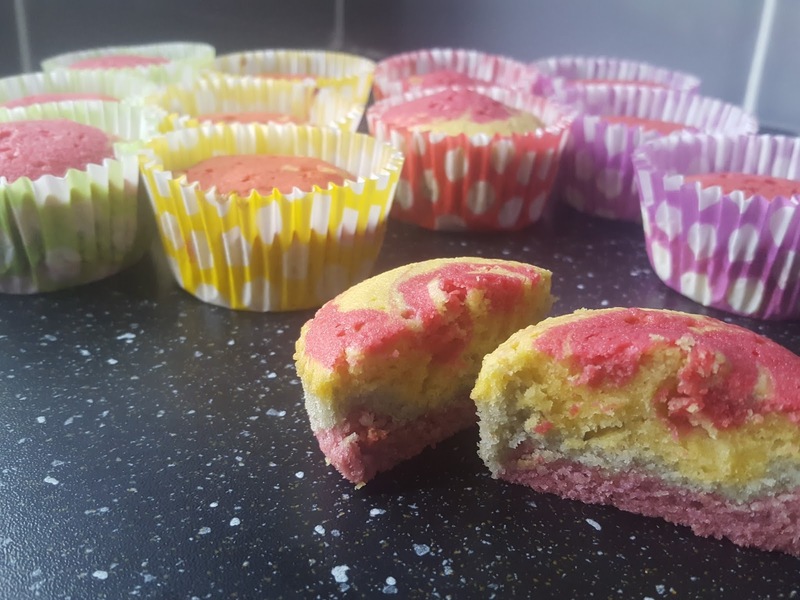 After we had finished mixing the colours together, Dan Jon started to put teaspoons of the coloured cake mix into the paper cake cases in a random fashion. 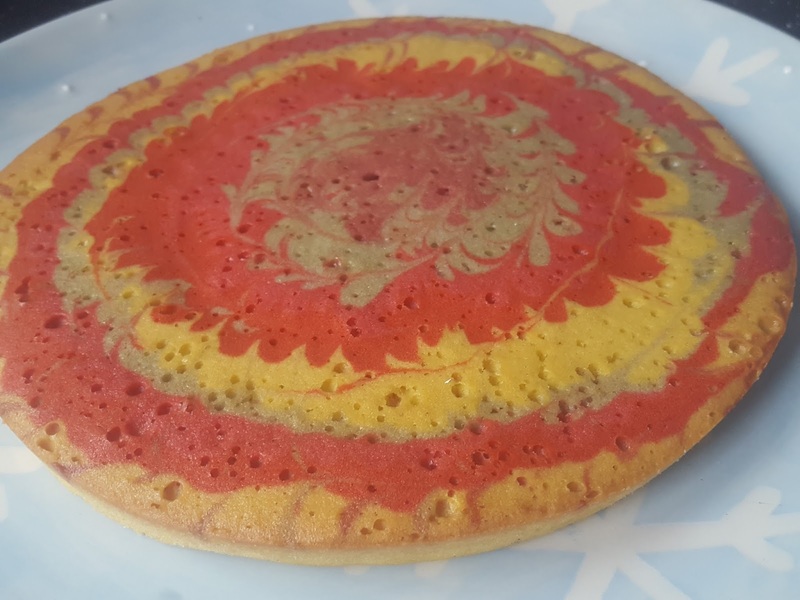 Again, it was decided to run a toothpick through them, to try to create patterns in the colours, how successful we were I can't tell you as generally when I eat one of them I do it in two bites and don't really look at the colours! 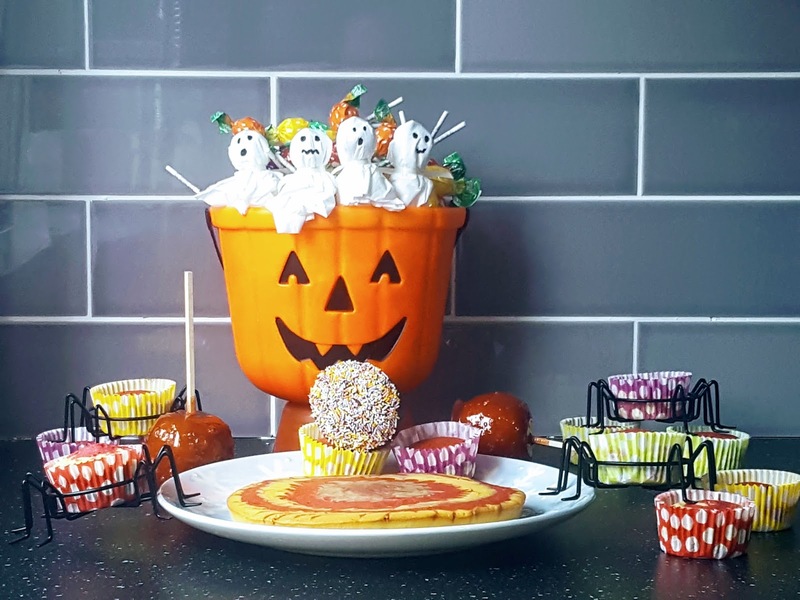 The cakes only took about twenty minutes in the oven (gas mark 4), and were delicious, well we had to try one of them to ensure that they were tasty before giving them away to our Trick or Treaters! Our larger cake took a little longer and was cooked within 30 minutes. You could still see the result of the toothpick mixing as you looked at the cake, and we had a slice of cake for pudding and the children declared it to be wonderful, which was lucky as if it wasn't there wasn't anything else in the house for them to eat!